As people who love the web, technology and our mobile phones, we readily admit that we're plugged in. All. The. Time. However, this can lead to information overload. Or a sense of never really focusing on who we're with or where we're at. Each time your phone chirps you absolutely HAVE to check it. Resistance is futile. Your Facebook friends know what you're doing, thinking and eating throughout the day. Every day. You've blown-up your significant other's phone because they haven't responded. You've given them 30-seconds to do so. You see a person in real life and can't connect with them. You'll Facebook them instead. You frequently stop talking with the person in front of you in order to check your phone. Eating a meal without checking your phone is uncommon. Your typical response times to email is 3-seconds. Your children recognize your obsession and rush to bring your phone to you each time it beeps, rumbles or squawks. If you've reached your critical max for online-associations, here are some ideas to help you unplug. 1. 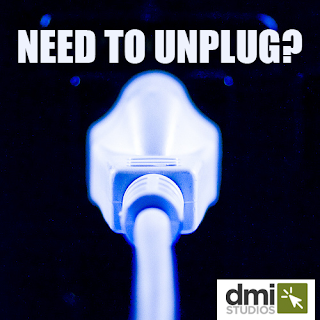 Decide how long you'll unplug. Maybe just an hour? A day? A weekend? Decide what's best for you given your current projects and commitments (no sense unplugging to relax and losing your job over it). 2. Make it easy to do. Maybe set a timer if you're looking for a 1-hour break. Put your phone on silent so you don't hear every email that lands in your inbox. Turn off your laptop and put it away. Shut off your desktop computer and put a Post-It reminder on it that you're taking a break. 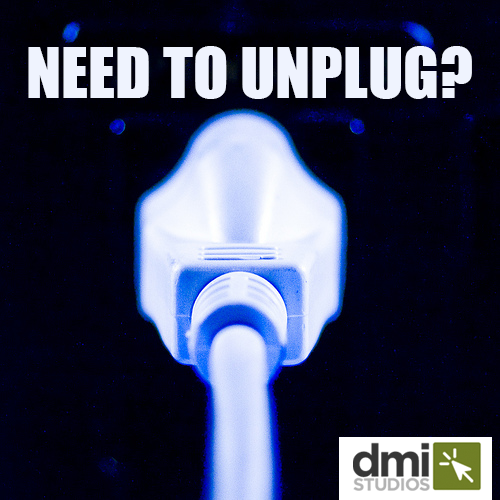 If you're unplugging for a longer period of time, be sure to respond to all important emails and possibly set up an auto-email responder to let interested parties know when you'll be available again. 3. Focus away from technology. You have a life outside of technology--trust us! Plan a date night, go see a movie, pack a picnic or a day-trip. Focus on people and places rather than what's happening online. When you've completed your break, be sure to Facebook us because we're dying to know how it went. Imagine your life without that little device sitting on your desk or bag or pocket right now. It's small, lights up and keeps you entertained while waiting for the doctor. But, what if your mobile phone was lost or stolen? Have you thought about the power that is contained in a trinket the size of your hand? A person could have access to your Facebook and Twitter and email--oh my! Though, it could be far worse. Do you have your company's Facebook page linked to your phone? How about their Twitter account? Or, the email addresses to all of your important business clients? Talk about possible social ruin. Remember: Your phone is not just a cute, trendy device you use to make calls. It's a mini-computer with powerful data. Keep that data out of the wrong hands! 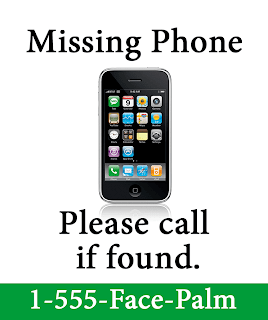 There are a number of free apps that will help you to locate your phone in case it goes missing one day. This way, you will know if you should stay cool or hit the panic button. Maybe it'll be on the table of that cute little restaurant you like to frequent for lunch. Or, maybe it'll be sitting on the desk of a menacing teen about to ruin your day: Facebook status: "It's gonna get ugly." For IOS devices, in addition to the ability to locate your device, Find My iPhone (on iCloud) can pinpoint your missing device on a map, have it play a sound, or display a message asking anyone who finds it to contact you. "If you don't find your device right away, you can help protect your information until you get it back with the Remote Lock feature, or use Remote Wipe to erase your personal data from your device and protect your privacy," Apple adds. Use the simple security mechanisms that come with your phone to secure your phone with a password/passcode. Set it to automatically lock within a few minutes. A hacker can still restore your iPhone to the original factory settings to remove the passcode. However, restoring also means erasing all data that was saved on your phone. In the end, he may get the phone, but you keep your data. Facebook status: "A social-life-wreck avoided by the passcode. Just another Monday." 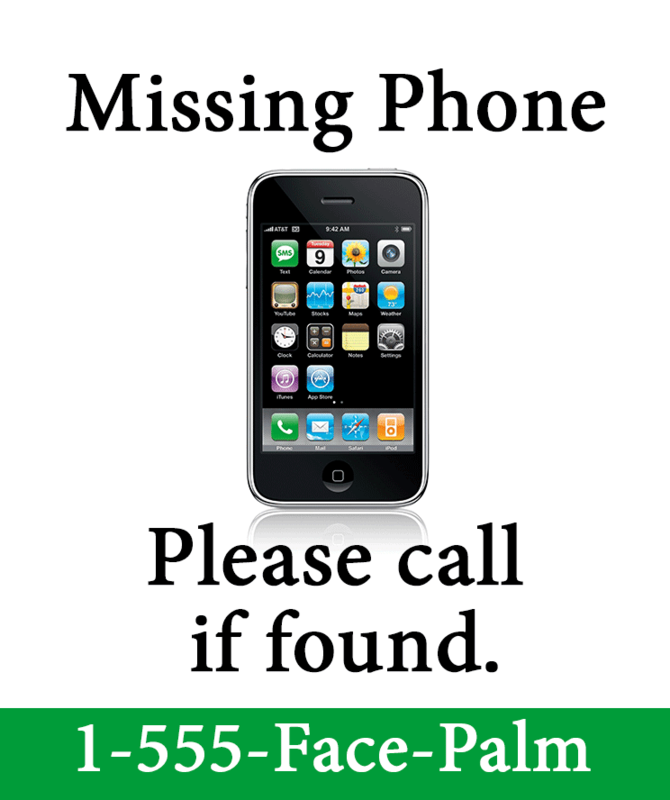 If you've come to realize that your mobile phone is gone for good, call your wireless provider. Even if you remotely wipe your device, it will still be connected to cell service with the ability to send texts or make calls. Your service provider can disable the phone and prevent others from using the device...and possibly running up your phone bill. Facebook status: "You win some. You lose some." A little pre-planning can give you piece of mind if you phone is ever AWOL. Don't forget about the power that is contained in your tiny device. And remember that every time you set it down in a public spot.